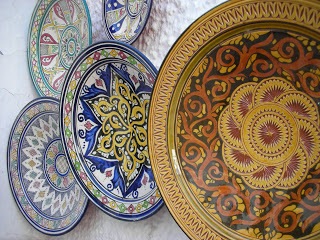 While Casablanca is romance and charm, Fes is mystery, madness and oh so Morocco! 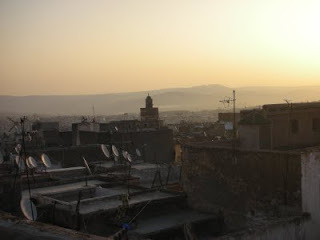 A short 3 hour train journey took us to Fes, and the first thing we noticed when we got off the train was a cluster of beige and brown buildings at the foothills in the distance. As our cab headed to Fes el Bali, our wonder and curiosity just kept getting higher. We got off at Bab bou Jeloud, one of the main entrances to the largest living medieval city in the world, and we had no clue what was going to hit us once we stepped in. With no hotel reservation we had to first find a place and then look around. Don’t ask me how, but a tout can sniff a tourist from a mile away. 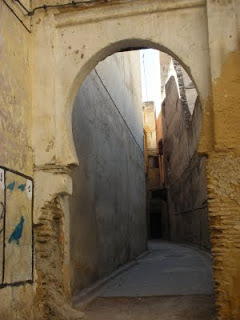 As soon as we got off, a young boy said “Riad Dar Bouinania” and voila, he had us in his clutches from then on. 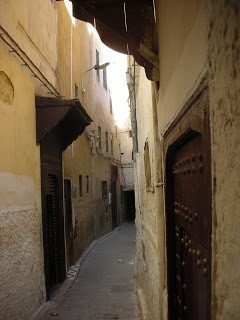 Walking into the walled city is like walking onto a movie set. You are transported back in time to an era where people lived very differently. 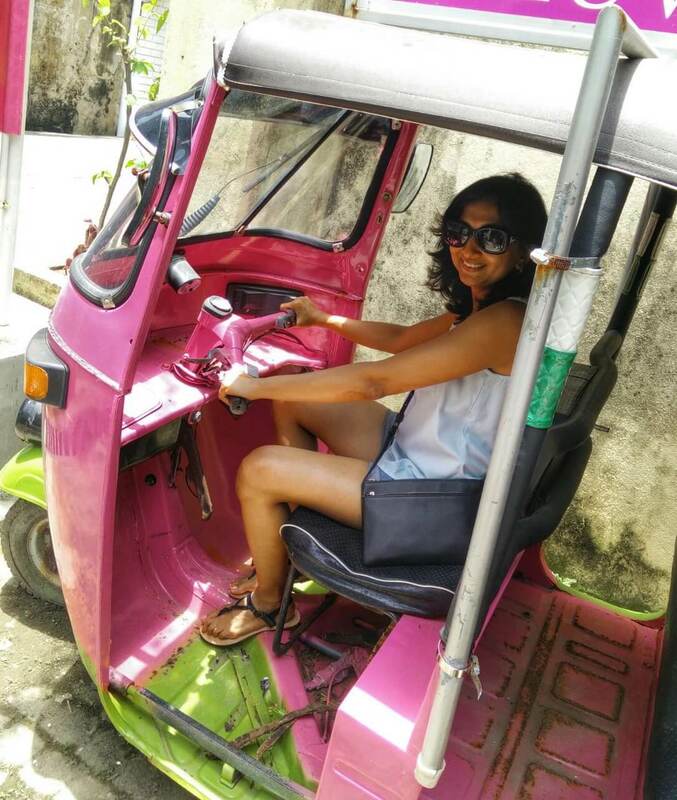 We had to make our way through a row of butcher shops, which was quite a torture, then came the vegetable and fruit vendors, olive vendors, vendors selling chameleons to everything else. All our senses were up and running. Once inside you are faced with 9000 odd alleyways. 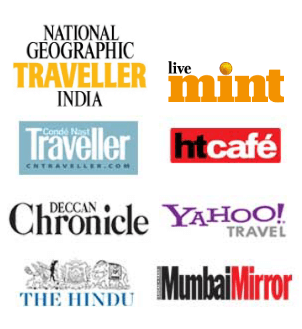 You can choose to explore the place on your own by following your book or take a guide. For us it was the latter, as we had quite nicely walked into his trap. A We spent the next 3 odd hours following our guide, listening to some history nuggets here and there. He had a lot of patience to say the least. We would literally walk two steps and stop for a picture. I never thought empty alleyways could look so stunning! But you realise that Fes is one well disguised market. 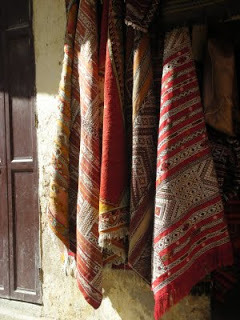 As you cover the hot spots like the tannery, visit the weavers, etc., you will invariably end up in a shop. The shop keepers are just happy to have you look around and photograph as they say, but be assured they will pester you to buy. 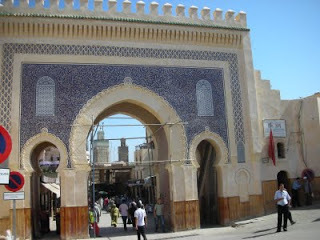 With over 300 mosques, numerous Riads, countless shops and stalls, Fes can be overwhelming at first. 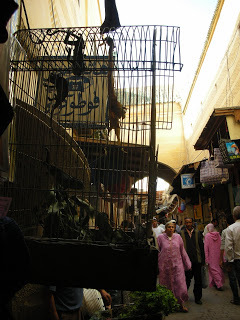 We did a few hours of walking around and then found a cafe near the Bab bou jeloud. Observing the locals and tourists over a glass of mint tea was a great way to take the city in. We saw several unassuming tourists get trapped just like we did! 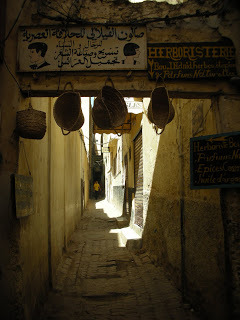 Fes was also our first experience of being in a tourist hot spot in Morocco. “India” seems to be etched on our forehead and we kept getting comments everywhere. At first we responded, then just nodded and ultimately just ignored them. Finally, when pangs of hunger took over we decided to go to a cafe called Kasbah, right near the gate. Recommended by the book, the restaurant did have some fabulous Moroccan food and it was here that we sampled our first cous cous (semolina). Bright and early next morning, we saw the sunrise over the old city and headed to a bessara stall. Bessara is a thick white soup made of fava beans. Its topped with a generous helping of olive oil and you can add cumin (jeera powder) and paprika according to your taste. Reluctant to enter at first, we eventually made our way to the back and joined some local workers at a table. We polished down our bowl of soup and sat around soaking in the atmosphere. This was one of the cheapest but one of our best meals in Morocco. 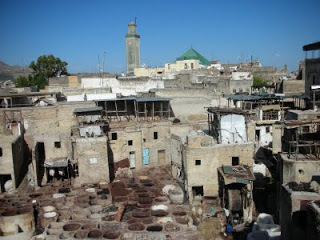 We decided to explore the other part of Fes, the world outside the walled city. Broad roads, boulevards lined with trees, the new city is in complete contrast to what lies inside the high brown walls. It is this dichotomy that makes Fes so intriguing.